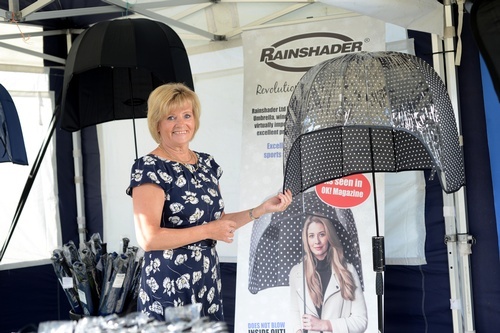 Rainsher Ltd is a company selling a unique umbrella online and at shows/fairs and to small retail shops. Rainshader umbrellas are high end unique umbrellas that have turned the conventional umbrella on its head. With the expertise of the engineers at Warwickshire University and the wind tunnel at Coventry University the umbrella is light, strong and wind tested to Gale force 7. The umbrella design is excellent in that it will not blow inside out, will not poke a passerby in the eye, superb navigation in crowds and does not invade other peoples space at sports events, festivals or concerts. As a result of meeting new customers at shows it has become apparent that our unique umbrellas design assists those with disabilities such as deaf and partial deaf as the clear front enables them to lip read and reduces the wind that can affect their hearing aids. Also our clear umbrella is increasingly used for those who use mobility scooters as they turn the umbrella the opposite way round to cover them and it enables them to have 360 vision and can see people to communicate.